A creative marketing by BMW..
Microsoft applied for trademark over “Be What’s Next” last month. Now it has started using it aggressively in its marketing materials. Personally I liked “Your Potential Our Passion” over the new one. In the recent SQL PASS conference a Microsoft executive shouted Be What’s Next after demonstrating the new Silverlight powered Project Crescent. Here is the details about it. Mondo Robot hired me to help create some animated segments to go into a 5-minute video for Microsoft. Dubbed “the innovation video,” it featured three different things microsoft is developing that they want to share with university students, in the hopes of getting them interested in working for the Gates-ster himself. See how PC & Mac stay entertained on a long flight together with the help of Blu-Ray on Windows 7 and Avatar. Microsoft released the above ad in time for holiday season. The ad shows the inability of Mac to play Blu-ray videos. The ad is really cool. Here is another really cool ad for IE9 and Windows Live. 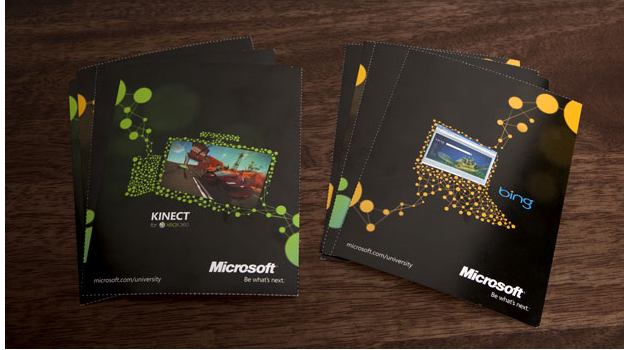 This was done by Microsoft Finland for promotional purposes.